1-Select unit system. Either Metric or Imperial units can be selected in OTSA. 2-Define Tunnel Geometry and Soil/Rock Properties. The Online Rock Mass Strenght (ORMAS) program can be used to estimate the soil/rock properties. 3-Define the support properties for your model using support tabs. Multiple support types (i.e. Steel set, shotcrete and rock bolt) have been provided.You may combine more than one support type in the same model (e.g. rockbolts and shotcrete) by selecting the checkboxes in the tab. Note: You need to press "Calculate" button or press Enter whenever input data is entered or changed in OTSA to recalculate the Factor of Safety. 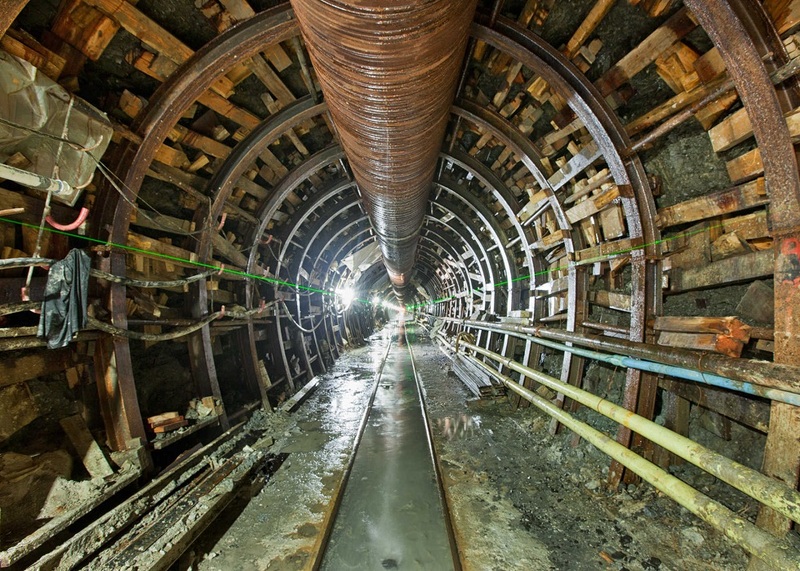 1-OTSA provide a graphic view of the tunnel and plastic zone including used supports. 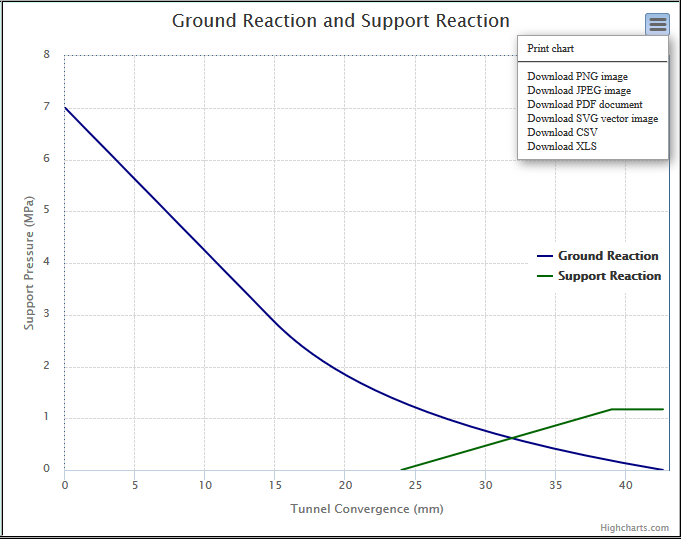 2-An updated ground reaction curve (GRC) will be provided after each calculation. If support has been added, then the support reaction curve is also provided. 3-OTSA provides an option for user to export chart and its data to CSV, XLS, PDF or some well known miage formats. OTSA offers a summary of input and output parameters as well as graphic view of the plastic zone including installed supports as well as ground/support reaction curve in pdf format. By clicking on "Report" button you will be able to save the report in your local machine. Rock-Support Interaction analysis in OTSA is limited to circular tunnels in an in-situ stress field in which all three principal stresses are equal and where the rock mass exhibits elastic-perfectly plastic shear failure. It should not be used for the detailed design of tunnels in more complex rock masses and in-situ stress fields (Hoek, 1999). 1. Hoek, E. (1999). Support for very weak rock associated with faults and shear zones. Proc. International Symposium on Rock Support and Reinforcement Practice in Mining, Kalgoorlie, Australia, 14-19 March, 1999. 2. Rocscience (2015), Rocsupport Online Help. BY USING OTSA, YOUARE AGREEING TO BECOME BOUND BY THE TERMS OF THIS AGREEMENT. IFYOU DO NOT AGREE TO THE TERMS OF THE AGREEMENT, DO NOT USE THISSOFTWARE. YOU ACKNOWLEDGE AND AGREE THAT THE SOFTWARE IS PROVIDED "AS IS"AND WITHOUT WARRANTY OF ANY KIND. ALL WARRANTIES, CONDITIONSREPRESENTATIONS, INDEMNITIES AND GUARANTEES WITH RESPECT TO THESOFTWARE, WHETHER EXPRESS OR IMPLIED, ARISING BY LAW, CUSTOMPRIOR ORAL OR WRITTEN STATEMENTS BY OTSA OROTHERWISE (INCLUDING, BUT NOT LIMITED TO WARRANTIES THAT THE CODE ISFREE OF DEFECTS, DAMAGES FOR LOSS OF GOODWILL, WORK STOPPAGE,COMPUTER FAILURE OR MALFUNCTION, OR ANY AND ALL OTHER COMMERCIALDAMAGES OR LOSSES, MERCHANTABILITY, SATISFACTORY QUALITY, FITNESSFOR PARTICULAR PURPOSE, TITLE AND NON-INFRINGEMENT) ARE HEREBYOVERRIDDEN, EXCLUDED AND DISCLAIMED. UNDER NO CIRCUMSTANCES WILL OTSA BE LIABLE TO YOU FOR ANYDIRECT, CONSEQUENTIAL, INDIRECT OR SPECIAL, PUNITIVE OR INCIDENTALDAMAGES, WHETHER FORESEEABLE OR UNFORESEEABLE, BASED ON YOURCLAIMS OR THE CLAIMS OF ANY THIRD PARTY, WHETHER BASED ON THIS AGREEMENT, ANY COMMITMENT PERFORMED OR UNDERTAKEN UNDER ON ORIN CONNECTION WITH THIS AGREEMENT OR OTHERWISE. ANY PERSON WHO USES THIS PRODUCT DOES SO AT HIS/HERS SOLE RISK ANDWITHOUT LIABILITY TO OTSA. OTSA is a free online program for determining a circular tunnel deformation, based on the simplified method using Mohr-Coulomb failure criterion as discussed in Hoek (1999). The Ground Reaction Curve (GRC) will be constructed from the elasto-plasticsolution of a circular tunnel subject to a uniform far field stress and uniform internal pressure. Multiple support types (i.e. Steel set, shotcrete and rock bolt) have been provided. You may combine more than one support type in the same model. OTSA is non-commercial and free to use. If you have questions or comments,please contact me at roozbehg@live.com.Visit my personal web page to find out about the other free programs/codes or my experiences and research interests. OTSA is free of charge, but it does cost money to keep the websites running, maintain the source code and add new features.If you use OTSA profesionally, you may want to make a periodic donation. It will help continue to develop and support the program and features that you use.A donation would not only demonstrate your appreciation of this software, but also help to advance development in the future.